I’ve been traveling with a GoPro camera for 7 years. Here are the best GoPro accessories & mounts to help you share unique travel adventures from around the world. In 2010 I left for Latin America to begin a new lifestyle of long-term travel. The original GoPro Hero camera was packed in my backpack. Since then I’ve owned all versions, including my current GoPro Hero 6. As a professional travel blogger, I’ve been using a GoPro to record travel experiences in all sorts of crazy situations where a regular camera just won’t cut it. Three of my adventure travel images have been featured by GoPro on their social media accounts. I seriously can’t imagine traveling without it! Today I wanted to share a behind-the-scenes look at some of the best custom mounts & GoPro accessories I use to make the most out of traveling with this amazing little camera. GoPro has its own selection of mounting accessories. However, I’ve found that some are not ideal for many reasons. The little plastic arms are a pain to adjust on the fly, and limited in their movements. There are better options out there. Like a RAM mounting system. RAM mounts use a 1″ rubber ball & socket system for super quick, easy, and secure adjustments on the fly. 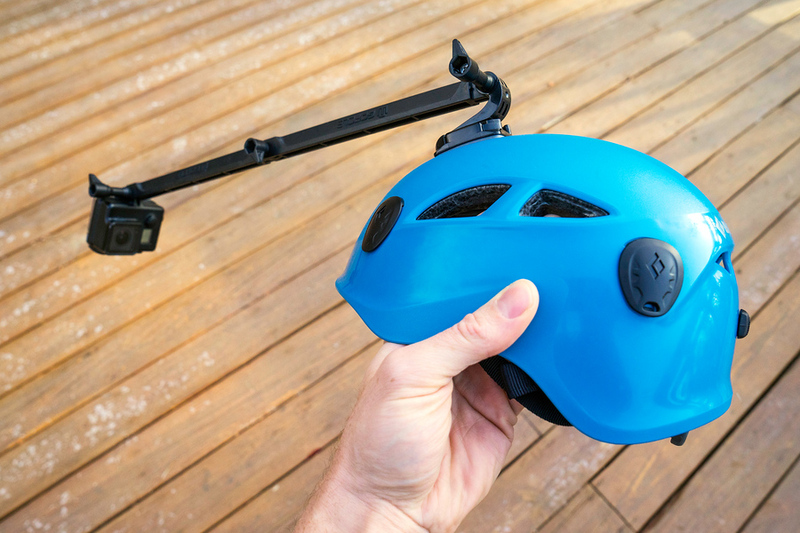 You can interchange the pieces to mount your GoPro in any way you could imagine! I’m a minimalist, and only pack accessories with multiple uses. 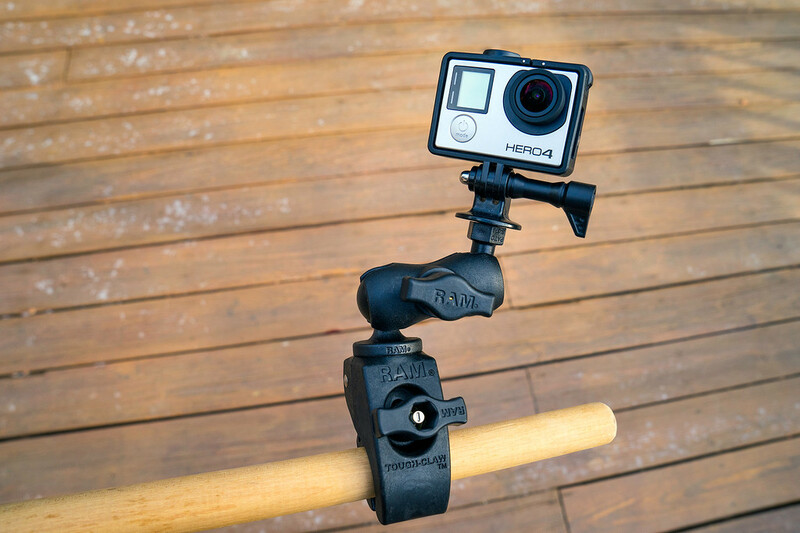 This amazing clamp & suction cup setup allows you to attach your GoPro to pretty much anything. Tree branches, chairs, fences, doors, windows, cars, water guns, motorcycles, bikes, luggage racks, etc. GoPro has their own clamp & suction cup mounts, but I prefer this RAM system. It’s cheaper, lighter, and more secure! The first is for snorkeling with the standard waterproof Hero 6, the second is for use with the SuperSuit Scuba Dive Housing (waterproof to 196 feet). Why a red filter? The color red gets absorbed underwater, so these filters help bring back some of the red, orange, and yellow hues. It makes your footage less “blue”, and more natural looking. I always keep an assortment of flat and curved adhesive mounts in my kit too. They work great as disposable mounting options for kayaks, helmets, and more. After attaching one, technically you should let the adhesive set for 8 hours. But they’ll also stay put after only 1 hour — depending on how rough the activity is. USEFUL TIP: Sticky mounts are easily removed with a hair dryer & credit/id card. A GoPro camera can cost $300-$400. It’s not something you want to lose. Which is why I always attach a safety leash of some sort. A standard point & shoot camera wrist leash with the ability to cinch shut works great. I recently used this type of leash to capture some great shots while rock climbing in Thailand. But when extra length is needed, you can also attach thin (but strong) 3mm accessory cord. Another useful GoPro travel accessory worth carrying is a hand-held camera extender (aka selfie stick) which allows you to capture video or photos of yourself from hard-to-reach angles. 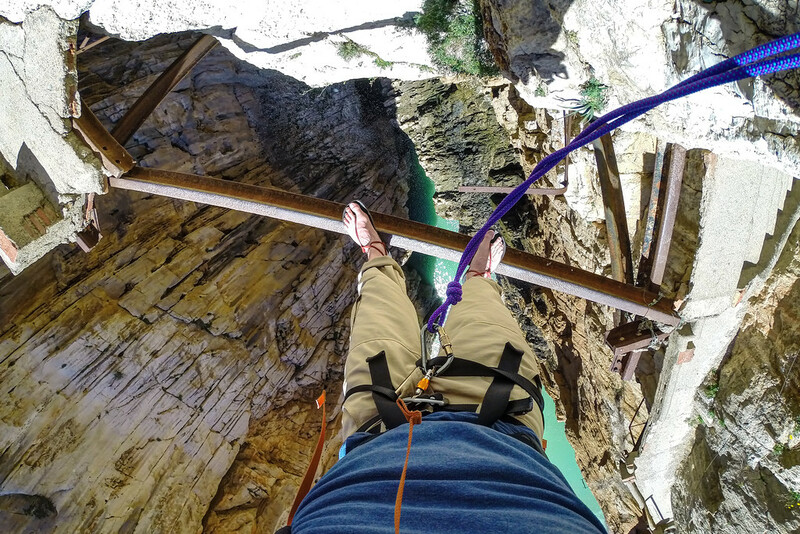 There are a few different GoPro selfie-stick brands out there. My personal favorite setup these days is a GoPole Evo. This telescoping selfie stick is lightweight, portable, plus it floats in the water! This 14 inch GoPro selfie stick extends up to 24 inches. If you need more reach than that, the GoPole Reach extends up to 40 inches. However it’s not as water-friendly. GoPole also makes a 2 piece extension arm that can produce some very unique angles attached to a helmet or kayak. 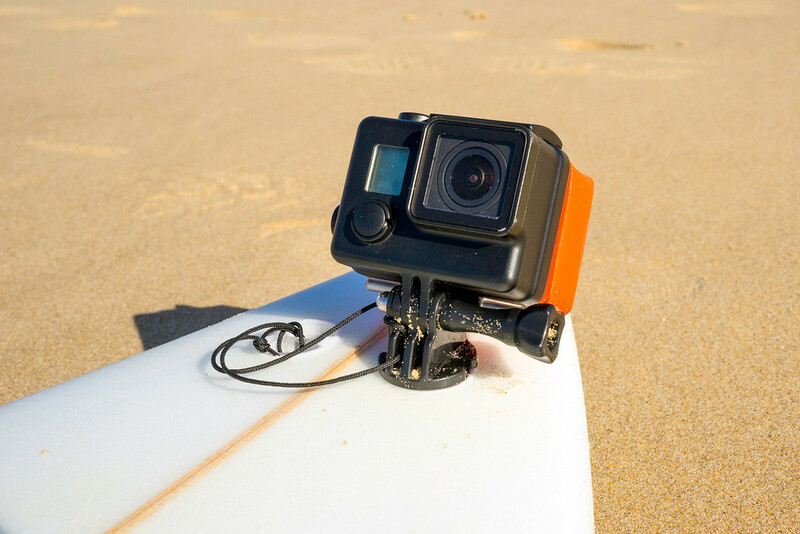 If you plan to do any surfing or paddle boarding, GoPro Surf Mounts are a good investment. However you can also find them for sale in most surf towns, along with the Floaty Back Door. On a recent surfing trip to South Africa, I installed a permanent FCS surf mount on my board for about $15. The last GoPro travel accessory I want to mention is the anti-fog inserts. These are a must if you’re planning to use your GoPro in or around water. While the GoPro Chest Harness is great for all kinds of adventure sports applications, I don’t usually carry one with me on the road. It’s kinda big, and I wouldn’t use it enough. However there is something smaller and more useful for me, the POV Action Mount which attaches right to a backpack strap. After 6 years of experience filming with a GoPro, I’ve learned a few things that will improve the quality of your videos & photos. TIP #1: Keep it steady! Because these cameras are so small, it’s easy to move it around wildly. But slow and steady shots make the best videos. Try to hold on with 2 hands if possible. Always remind yourself to move slow & smooth. TIP #2: Practice shooting “from the hip”. For example, if I want to shoot a selfie of myself, I know that aiming the camera at my chest rather than my face will result in the best composition due to the wide angle. TIP #3: Use the Time-Lapse mode to capture great selfie photos. This mode automatically takes a photo every .5 seconds after you press the shutter. You can now move the camera around or change your expression, continuously shooting photos. You’ll end up with way too many — just pick the best and delete the rest. TIP #4: Just because you own a GoPro does not mean your photos & videos will look exactly like professional ones produced by the company. However, you can now learn their specialized techniques with the release of an amazing new book called GoPro: Professional Guide to Filmmaking. 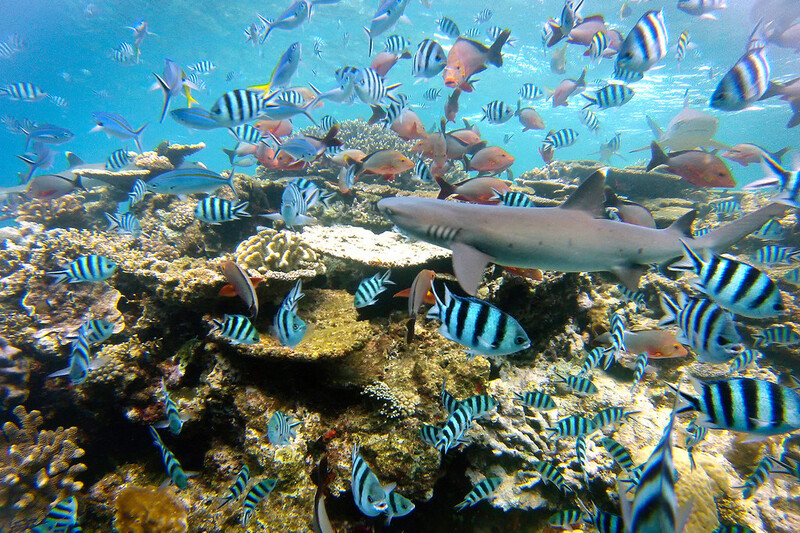 Have fun with your GoPro, it’s one of the coolest travel cameras available!